Dowels are great for building woodworking projects. They hold better than screws, especially in plywood. They’re generally more attractive than screws. And for shop fixtures, you never worry about accidentally hitting a dowel with your new saw blade. Screws have their place, like where a part might need to be replaced. Otherwise, if you can drill a hole and put in a screw you can drill and put in a dowel. The only problem with dowels is cutting them. They want to break off and/or fuzz up when you hand cut them. Except for 1/4-inch or smaller. I cut those with a pair of garden pruning shears. They work great and leave a nice cut. This jig lets you cut a gazillion usable dowels all the same length quickly. I always have a bunch of 3/8 and 1/2 dowels thrown on the bottom shelf of my bench. And, I can cut more in a heartbeat. This is another straightforward fast project. It only requires you cut two pieces of 3/4 ply. You can make it for any size dowel you wish. The next project I post will be the wide/narrow board tenon jig using 3/8 dowels. The T-square, push sticks and the dowel jig will be used to build it. This project is straightforward but there are always little tricks to help. If you have a drill press use it. If you don’t then drill by hand. No big deal. We’ll square things at the tablesaw when we put it together. Don’t be a he-man and try to hold the piece. Clamp it up. Keep the drill as straight as you can and let the drill bit do it’s job. Pull the bit back frequently to clean out the bit. You’ll be drilling into end grain plywood. The drill will want to jump between the plies and split it. Start with a small drill and step your way up to the 3/8 bit. A 2 ¼ hole is a fairly deep hole. The dowel will be a booger to push through it. Using your 3/8 drill bit, put it all the way through the drilled hole and move it around a bit to wallow out the hole just a bit. Oh come on – we all do it. Try the dowel. Keep going until you can push it in with a bit of force. You’ll notice it gets harder to push as you go deeper. Turn the workpiece over and repeat the wallowing from the other end. Stop when you can push the dowel all the way through. It should be tight but go through with a twist. What you have done is opened up the ends of the hole and kind of formed a figure-8 inside. Take the two pieces and a short length of dowel over to the table saw. Have your glue, glue brush and a damp rag/paper towel handy. If you haven’t installed a miter fence yet then clamp a temporary board to the gauge to act as one. Insert a dowel into the hole in the small piece and brush the back of the piece with glue. Set it against the larger piece and clamp them both to the fence. Using your adjustable square or some kind of scale, level up the dowel. Make sure it is the same distance to the saw table from where it goes into the piece and the end of the dowel. You can shoot a couple of brads near the top to hold the pieces till the glue dries or just pull out your miter gauge and let things set. 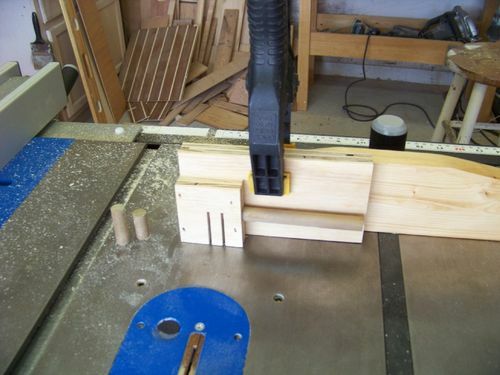 Wipe off any squeeze out and any glue on the tablesaw or the adjustable square. Put a dowel in the jig and push it until it is just flush with the end. 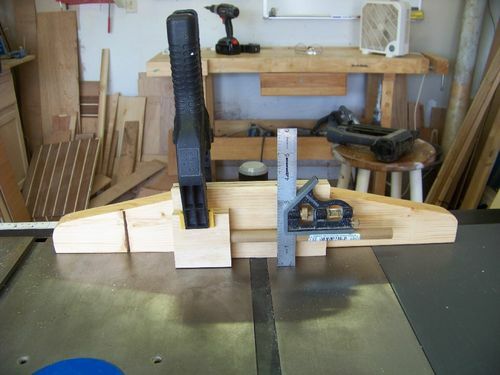 Clamp the jig to your miter gauge fence and measure over 1-inch and make a cut mark. Actually, I cut about 1/16 th shy of the length of the dowel I want. That leaves a gap for glue and air. Before I figured that out I used to watch my dowels rise back up after I tapped them in. Spooky. Now cut through the jig at the cut mark. Feed the dowel stick in with a push and twist motion and the cut piece will fall out the end. Push the dowel stick until it is flush with the end. Now make a mark at 1 1/2 inches and cut again. Push and twist the dowel and the longer piece will fall out. Now that the jig is built you can always crank out dowels quickly. You already have your cuts in the jig. Place the jig over the blade on the length cut you want and adjust the blade height. Bring up the miter gauge and clamp it to the fence. Put in a dowel and you’re good to go. I hope all is well with you and yours. The “Pile” pic is all the things we’ll be making in the series. We’ll be getting through all of them. Maybe somthing else too. Most of the things are easy to ID. I’m still waiting for someone to ask what the heck a couple of the things are. A hint, but don’t tell anyone else, what if you had a router table and the fence was portable/transferable to any flat suraface so you could use it with a handheld router too? Great Idea. Thanks for all of the Details also.